Informator 1 was a prototype communications satellite for the Koskon (Space Conversion) Global Space Communication System to collect and transmit data from several scientific stations with an additional radio amateur hosted payload. It was launched on 29 January 1991 from the Plesetsk Cosmodrome by a Kosmos-3M launch vehicle. The 600 kg satellite was inserted into an orbit of 960 km by 1,010 km at an inclination of 83° under the sponsorship of the Ministry of Geology. Informator 1 was developed by the Polyot Production Association and the Elas Scientific Production Association and featured a KAUR-1 type cylindrical bus (diameter 1.8 m, height of 4 m) with solar cells designed to produce 1 kW average power. Informator 1 relied on gravity gradient stabilization and was projected to have an operational lifetime of 5 years or more. Informator 1 also carried The joint Soviet-German Radio-M1 radio amateur payload, which has been designated both RS-14 and OSCAR 21 (AO-21.) The German RUDAK-2, built by AMSAT-DL, was the digital component of the Radio-M1 transponder. The Soviet component was built by AMSAT-U-Orbita. The operational Koskon system was to consist of 32-45 Informator-class satellites with multiple satellites in several orbital planes. Although replacement spacecraft were to continue to be launched a single payloads by the Kosmos-3M booster, the initial groups of three spacecraft were to be deployed using the Zenit-2 booster. The first operational spacecraft were to be launched as early as 1997 with deployments completed by 1998-1999. But eventually the project was cancelled, with no further follow-on spacecraft ever launched. Koskon uplink (1.656-1.660 GHz) and downlink (1.555-1.559 GHz) communications were to be at a rate of 4-5 MBaud, while cross-link communications at 2.0-2.1 GHz and 0.5-1 MBaud also had been advertised. C-band transmissions might have also been possible. The two primary control centers were to be located in the Moscow and Omsk regions. The satellite remained operational until switched off for financial reasons on 16 September 1994. 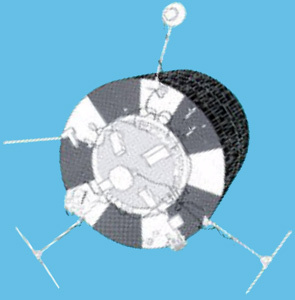 After this, the amateur payload continued to operate for a few days on the remaining battery charge and AO-21 finally fell silent on 12 October 1994.